Apache and the Mepaco group have a dedicated department of field service professionals. Production uptime is our top priority to help customers with commissioning, ramp-up, maintenance, repair and emergency breakdown support. The Mepaco Team understands how valuable production uptime is to your company’s bottom line. We are evolving our service team to provide quick response commissioning, ramp-up, maintenance, repair and emergency breakdown support. Here are the top three reasons why spare and replacement parts should be purchased from Mepaco, your equipment supplier. Quality and accuracy. While spare parts can often be found from all types of online and catalog suppliers, will they be the quality parts needed to function properly in Mepaco equipment? Parts ordered from Mepaco are accurate to that specific piece of equipment that will provide optimal performance in your equipment. Support. Mepaco's parts and service department have years of industry and field experience to support your maintenance team for questions, training or service. Relationship. Parts managers have a relationship with Mepaco's parts and service department. We can help to answer your questions and provide preventative maintenance parts and make recommendations on long lead time parts. We work with our customers to meet their timelines and minimize downtime. Download Mepaco's Field Service Flyer! Can I schedule onsite time for my equipment? Onsite training is available for both new and existing equipment. From structured classroom type training to hands on, operation and maintenance procedures are covered. Do you offer machine and equipment audits? A comprehensive review of your Mepaco equipment is recommended periodically. Our field service technician will completely analyze your equipment for operational, maintenance and process metrics. A complete findings and recommendation report will be provided. 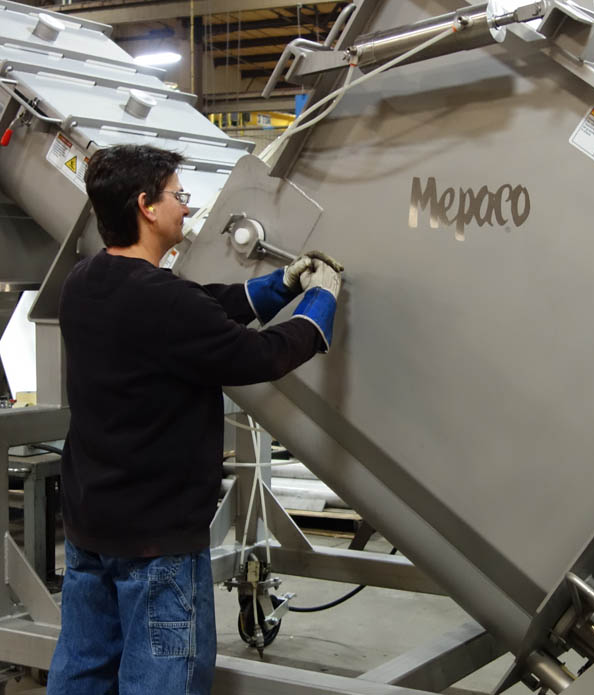 Our field technicians are fully trained on all aspects of Mepaco food processing equipment. Repairs, retrofits and preventative maintenance are conducted and completed in a timely manner. Since we know the design mechanics of our equipment, field service jobs are done right…the first time around. Do you recommend we have spare parts on hand? While we use some of the best components made, parts do wear out. For critical components, we recommend a reserve supply at your production facility. Since our parts department stocks thousands of SKU’s, we do offer expedited delivery service for parts that you may not have onsite. How quickly can we get a gearmotor? While most gearmotors are machine specific, we can expedite the shipment, so downtime is limited. A manual is shipped with your new piece of Mepaco equipment. If additional manuals are needed, we can forward a digital version for your staff. Does the field service group work on non-Mepaco equipment? Some field service work can be very similar to Mepaco equipment. Mepaco’s field service manager will carefully review the scope of the work to be done and assess which service work is feasible. What hours are the Mepaco field service team available? Mepaco Field Services Techs are available 365 days/year 24/7. If there is a critical issue, Mepaco will work with your company to schedule and provide service to keep downtime as short as possible. How long does it take for a service call? Typically, our service team can work in a call in as little as a few days with the maximum wait time at a week. Does Mepaco provide electrical and programming support? Yes, Mepaco has skilled electrical controls experts for installation, trainings, upgrade and service work. What is the price and availability of my part? While we have a stock room of replacement parts, some equipment may be custom designed and require a part to be manufactured. Call the Parts Manager to verify the price and availability on the part you require.